Since I earned my eagle pine I have been looking for a way to give back. 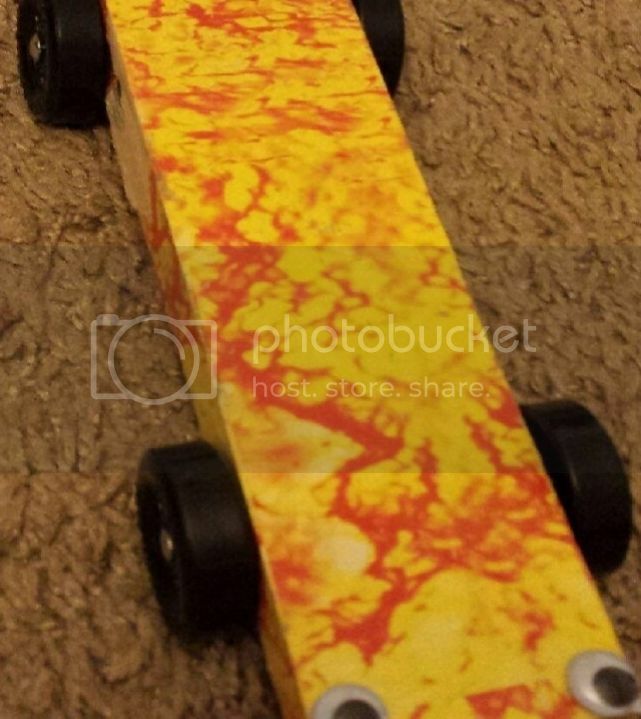 So I jumped at the chance to help out two brothers with there first pinewood derby. After searching the internet I decided out best option was to create rail riders. I also bent all the axles to help with alignment. Weight was right at 5oz with a balance point 1" in front of the rear axle. We ended up using the Wedge design. This is the younger boy's car. He ended up taking second place in his Tiger den. We went a little different direction with the older boy's car. Unfortunately this car was near the bottom of the entire pack. The night before the race we were allowed to test the cars and check them in. During this time I was told the adults have an a derby after the scout's. So in four hours (in the early morning) I banged out a slightly different design. Not knowing any better I built the car to the same rules as the scout's car. Instead of a wedge I made my car flat and 1/2" thick. Ended up taking second place! Although I was excited about this I was left with a huge question. If all three cars to the same standard why were there three different outcomes. Any help or suggestions would be helpfull. First of all, good for you for helping younger boys with their car builds! Looks like you've got some fundamental build steps figured out, or are in the process of figuring them out. While you might have attempted the same techniques during the construction of the three cars, it's possible that you had more success than others on a particular car, accounting for the variation in performance across the three cars. Could be anything from the axle hole drill angles, to the degree to which you may have worked on the axles to remove rough spots on the nails. Sometimes, it's as simple as an aerodynamic difference, but usually, it comes down to alignment and friction. Got any more details regarding the cars' builds, and preparation? That would possibly shed some more light on why you saw the variation in speeds that you saw. Thanks for the reply. Besides the obvious aerodynamic differences I tried to do everything the same. I ended up having to buy pre-cut wedge blocks that came with wheels and axles that were already polished. I broke-in each wheel with a dremel tool. I drilled the axle holes with a drill press and a fence. Graphite was added throughout the process. The major area of non uniformity would have to be that I had to bend each axle the manual way. (i.e. : a vise and pliers) I am looking for a better way, but spend spend a lot. So the next obvious line of thought would be is a rail rider truly faster than straight runner. On the "flame car" all the weight is internal; where as the eagle car has the dome weight. Would the difference in center of gravity have a huge effect? If you have access to a drill press, you can drill canted axle holes using nothing much more than a 3/32 metal rod strategically taped to your wooden block. Our cars got faster and more consistent in how they ran when we stopped trying to manually bend axles, and just started drilling canted axle holes instead. Use this site's search function to look for how to drill canted axle holes without using a block or a silver bullet. If you have access to a block or silver bullet, then all the better. Rail riders do run faster than cars designed to try and run straight (running straight is likely not going to happen due to track variation, track seams, wheel imperfections, weight imbalances, etc. so why try?). Get good at building a rail runner. Weight location matters. Helps with stability, and whether or not you're optimizing the maximum potential energy available in the car's design. Generally speaking, the lower and closer to the rear axle, the better. However, good results can be achieved using the tungsten domes. The key to a fast car is all in how you integrate all of the various build techniques. Scrollsawer wrote: If you have access to a drill press, you can drill canted axle holes using nothing much more than a 3/32 metal rod strategically taped to your wooden block. Or a 3/32 drill bit, which is likely something already on hand. Is a rail rider truly faster than a straight runner? The Laws of Physics would say yes. However, there are many, many things involved to make that happen as I'm sure you already know. We are required to use slots, stock wheelbase, graphite and allowed to raise one wheel. If I might share my own experience. I build cars to rail ride , set the drift on the tuning board to 2" in 4' and then take it to a 35' Best track. I have always had to adjust the toe to get a faster time. We first race on a 35' Best track at our District races is why I bought a 35' Best track. I know from my records what speed I need to reach to hopefully do well at the District. I am well aware there is a gentleman who tunes his cars on the kitchen floor, mails them away to the Mid America race and has 2 cars that finish in the top twelve. My Hat is off to him. Our Teams are fortunate to do well at the District races but we don't always take 1st place. 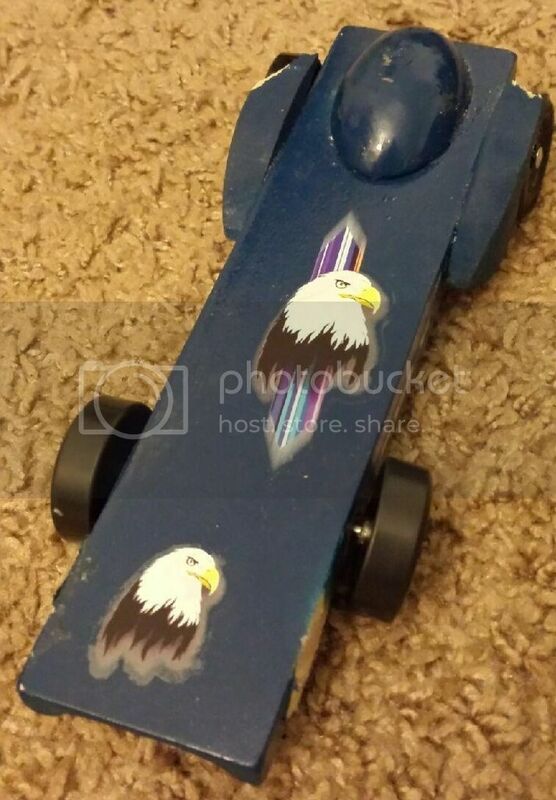 I think the Laws of Physics pertaining to Pinewood Derby cars are all on Derby talk. Learn as much as you can and I think you'll be happy with the results. I'd say the boys fun with the demolition derby as well.. who won that one? Thank you everyone. I knew that drilling canted holes was an option, but didn't have a foolproof way of making it happen. I like this idea much more than bending axles. How far from the base do you place the center point of axle / drill bit? Race#67: I think you are talking about the front left wheel. When I drilled the axle holes I forgot to raise one so the tire would not touch the track. My quick solution was to simply put a greater bend in the axle. People kept commenting about it. whodathunkit: I don't know I wasn't there. The fenders where built out of really soft balsa wood so I am truly not surprised by the damage. I did hear that there was something to do with a dukes of hazard style ramp into a wall.